AtHomeNet, Inc. announces their recent partnership with Conquest Solutions, LLC. The partnership will provide Georgia area customers with hardware, installation and ongoing service supporting AtHomeNet’s brand new platforms. AtHomeNet CEO, Susan Sanders poses with Conquest Solutions owners, Rose and Lance Retter to announce their new partnership. AtHomeNet, Inc., a provider of web-based services for community associations, announces their new collaboration with personalized IT services company, Conquest Solutions, LLC. AtHomeNet will be working with Conquest in Georgia to provide hardware, installation and ongoing service support for AtHomeNet’s brand new “FrontDesk Services” as well as future Access Control offerings. AtHomeNet currently provides websites for more than 700 existing Georgia condos and communities and FrontDesk Services adds Package Tracking, Visitor Management and Valet Management services to that website package. Conquest Solutions will assist communities with barcode scanners, signature pads, badge printers and other access control devices and infrastructure needs to get the most out of the FrontDesk Services solution. Conquest Solutions, LLC. was founded in 2004 with the mission to provide both businesses and individuals with personalized IT service. Known for working with several premiere communities in Georgia, including: Big Canoe, Country Club of the South, and St. Marlo, Conquest Solutions makes it their goal to provide the best, most reliable solutions and advice. Their priority is to make every customer a satisfied customer. 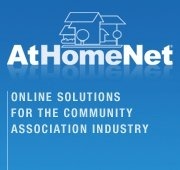 To learn more about Conquest Solutions, visit their website at http://www.csatlanta.com. AtHomeNet® is the nation's premiere provider of customized, affordable websites for communities and Professional Association Management Firms. The company was founded in 1998 by Jeff and Susan Sanders. With their HOA websites now being used in over 2 million homes in and more than 7 countries, AtHomeNet continues to grow as a company and enhance their services in the ever expanding world of online technology.